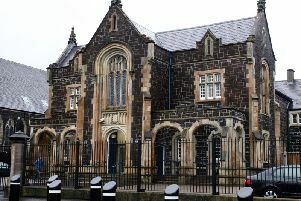 A Larne man facing robbery charges allegedly breached his bail and is accused of telling a police sergeant he would “put a bullet in the back of his head” and “get a shotgun and shoot the rest of his family”. A police officer, speaking at Ballymena Magistrates Court on Thursday, alleged the comments were made by Jamie McCombe (20), from the Craigyhill area of Larne. McCombe is charged with robbing the Hillstop chip shop in Larne three times last year and that on two of the dates in 2016 he had a firearm or imitation firearm with him. He had previously been released on bail to an address outside Larne but then allegedly handled stolen goods earlier this month. When arrested it was alleged he had cannabis and caused damage to two police cells. He allegedly assaulted a designated person in the execution of his duty and was accused of assaulting the police officer he is accused of making the threats to kill to. McCombe appeared before the court via video link from Maghaberry jail for a bail application and a prosecutor said it was being opposed. Defence barrister Alan Stewart said the alleged offences in the police station were “reprehensible” . He said McCombe had not been getting his anti-psychotic medication nor his Diazepam and claimed his client’s mental health would be better managed in the community. District Judge Peter King refused bail and the case was adjourned.